THE all-Australian showdown between tennis wild child Bernard Tomic and Adelaide teenager Thanasi Kokkinakis at the Brisbane International today will tell us much about the progress of both young players. Tomic is trying to restore his reputation. Kokkinakis is trying to build his. On a day where Australia's youth brigade shone with Kokkinakis, Tomic and James Duckworth all producing first-round upsets against higher-ranked opponents, giving tennis fans hope that along with another exciting teenager, Nick Kyrgios, a new era was fast approaching. Tomic, 22, who loves fast cars and seems to attract attention for the wrong reasons at times, says he has knuckled down with a new fitness regime and is now ready to climb the world rankings again. He certainly showed maturity and composure to beat quality American Sam Querrey 7-5 7-6 (7-5) in the first round after a sluggish start. It was a clear warning to his rivals he is on the way back and not only out to win in Brisbane but also to threaten in the Australian Open in a few weeks. Kokkinakis, who would have watched Tomic burst on to the tennis scene, knows the exposure, profile and, more than anything else, the momentum he can get by knocking him over. It was not that long ago, in June 2012, that Tomic was banging on the door to a world top-20 ranking. 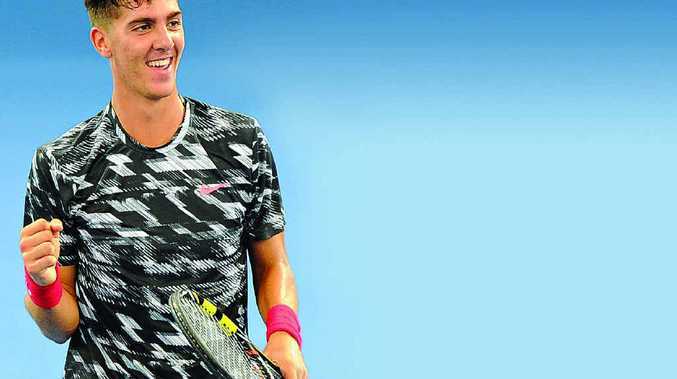 Kokkinakis, the other half of Australia's "Special K", would be keen to step from Kyrgios' shadow and announce his own arrival, even at the expense of fellow Aussie Tomic. He was almost there in 2014 when he won five of his 12 matches against players ranked in the top 100. He showed his aggression and desire in dispatching tournament eighth seed and world No.25 Julien Benneteau on Monday. If he can handle Tomic's serve and heavy groundstrokes he can push his Gold Coast rival and move into the third round looking for another big scalp. Yesterday, wildcard John Millman set up a dream second-round clash with No.1 seed Roger Federer. The 25-year-old from Brisbane had an easy two-sets win over American qualifier Rhyne Williams 6-3, 6-1. The news was not so good for soon-to-be Aussie Daria Gavrilova, who went down fighting 6-3 7-5 to German third seed Angelique Kerber. Former American college star Steve Johnson proved a little too strong for Australian Marinko Matosevic, coming back from a set down to win 2-7 7-6 (7-0) 7-5.